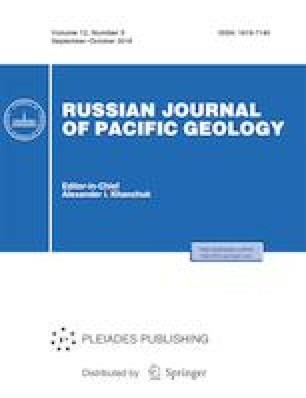 The mineral and chemical compositions of the layered subvolcanic ultrabasic rocks formed through fluid–silicate (liquid) separation of the ultrabasic magma into high-potassium and low-potassium fractions are characterized by the example of the layered picritic sill from the Late Cretaceous ultrabasic volcanic complex of Eastern Kamchatka. It is determined that the main potassium concentrator in the picrites from the high-potassium layers is a residual volcanic glass containing up to 8–9 wt % K2O, which is unique for ultrabasic melts. This work was supported by the Far East Branch of the Russian Academy of Sciences (project no. 15-1-2-053).